On August 16, 2017, the Lord called Mr. Norman Crawford home to heaven. For him, it was not a great distance. He lived and exuded something of the fragrance of heaven by his very countenance. As a former editor, he is deserving of the tribute we have given him in this issue of Truth & Tidings. Along with fitting tributes from both his local assembly and those who knew and labored with him, a number of articles from his pen are included. One feature of his oral and written ministry was its relevance. This quality can be seen in the few articles that are included in this issue. They range from the practical to the doctrinal, from that which would interest young to that which would appeal to those who are older. The Lord has seen fit to take a very valuable man from our midst. Men are raised up to serve their generation, yet his life of service spanned several generations. In many ways, his home-call is the end of an era. There are still a few men who have links with men who pioneered years ago in this country; Mr. Crawford is one of the last. He was in every inch of his frame, a true Christian gentleman. Of significance, the tributes which follow speak as much of the character of the man as they do of the richness of his ministry and the blessing which flowed from his service. His ministry was a great blessing to assemblies in North America and farther afield. His writing has left us a rich legacy of truth. His teaching was formative for many in our generation and will be sorely missed. His gospel preaching was with power and warmth; his ministry and teaching were Scriptural and accurate. His departure reminds us that while God calls His servants home, the work goes on. When the Lord took Elijah home in dramatic fashion, the mantle fell from his shoulders to be taken up by a younger man. As he approached the Jordan, his question was not, “Where is Elijah?” His question was, “Where is the Lord God of Elijah?” (2Kings 2:14, KJV). 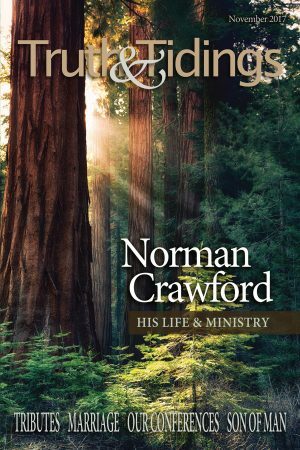 The God Who raised up, equipped, and used Norman Crawford, is still able to raise up and gift men today for service in the public sphere. The home-call of every believer serves as a challenge to the next generation to follow their faith (Heb 13:7). Lives of men who have faithfully served the Lord may intimidate some with a sense of our own personal inadequacy. They are never meant to intimidate or even to be imitated. They are meant to inspire and encourage. May there be among us those who will stoop to take up the mantle and serve God in their own generation.